I have always wanted to make my own hummus. I'm not going to lie - the first time I set eyes on it, I was a bit skeptical, but after that first taste, I was completely sold! 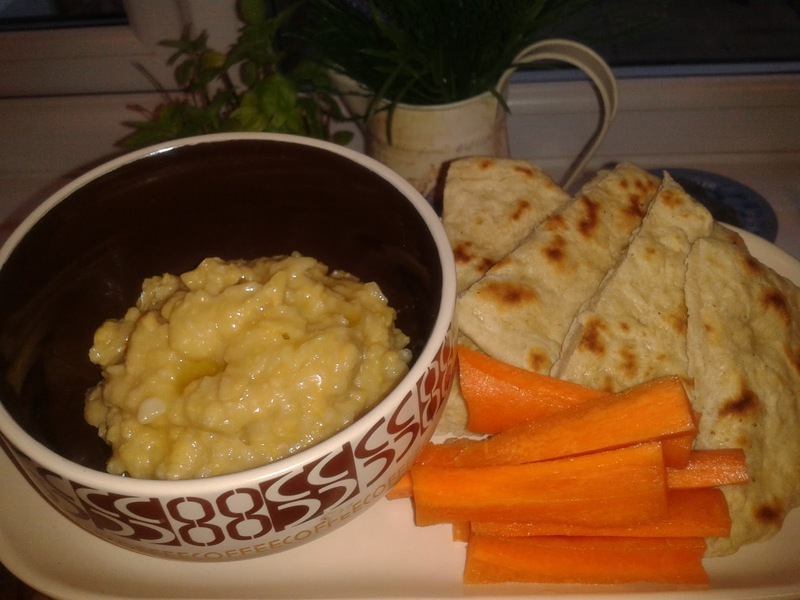 Hummus is made by crushing/blending chickpeas with a few other kitchen cupboard ingredients and can be used as a dip or a spread. It's a great source of protein, fibre and numerous essential vitamins. Like peanut butter, you can have it super smooth or, as I like it, with chunky bits. I've served mine up with a few carrot sticks and some home-made flatbread (recipe also below) but of course you can eat it with just about any other crunchy vegetable out there (sliced cucumber, raw pepper etc.). They also go well with baked chips, crackers or, as fellow blogger Berry Dakara cleverly suggested in my mini pizza post, as a topping for your veggie pizza. To make the hummus, place the chickpeas in a large bowl and crush with the back of a fork to form a chunky paste. Add the crushed garlic, salt, lemon juice, olive oil and chilli powder (optional), and give it a good mix. Serve in a little dish and drizzle a little extra olive oil over the top. Combine all the ingredients in a large bowl, making sure to add the water a little at a time until you have a soft dough. Heat a large frying pan and coat the bottom with a little sunflower oil. 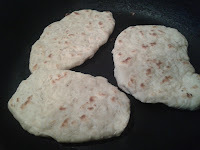 Divide the dough into 4-5 parts and use your hands to form a flat, roughly round or oval shape with each piece. Once the pan is hot enough, drop the bread in and cook for about 2 minutes or until it starts to form brown spots all over. Turn over and brown the other side. i love hummus use it to snack on chips and veggies all the time. never thought of making it myself, thanks for the recipe.